You'll receive your brochure in 5-7 business days. Help your families tell more of their loved one's life story with an online memorial. 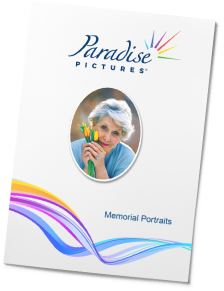 As a customer of Paradise Pictures, you are in the unique position to add more value to the memorialization products and services you offer by including AdmiredLife. 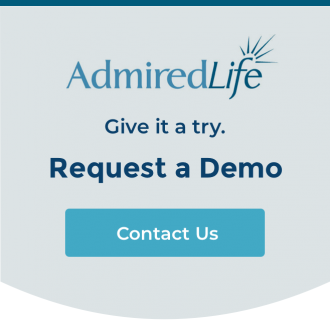 AdmiredLife is a state-of-the-art Online Memorial System. It was created with a family first approach. It will never have ads and will always respectfully present memorial information. By including your company name and information in a tasteful manner on the AdmiredLife memorial, you receive credit for helping your family memorialize their loved one. Easily included with a Paradise portrait - ask us how. 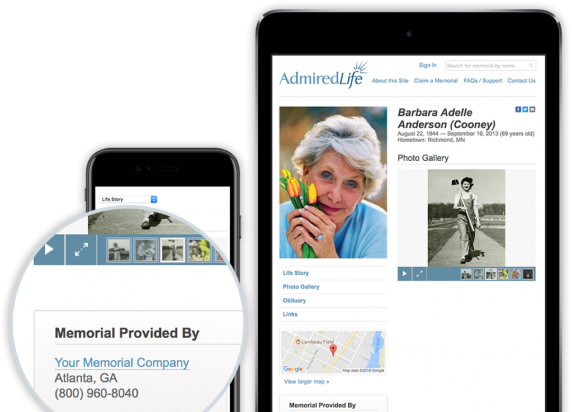 Include your AdmiredLife online memorials as a list on your website. This powerful feature will have families coming back to your site to look up their online memorial thus adding value to your presence on the Internet. Our widget generation process is quick and can be implemented by you or your web developer in less than an hour.